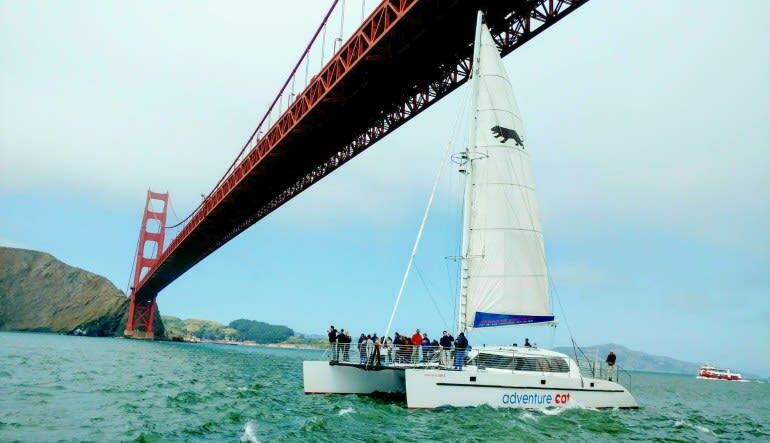 Sail the San Francisco Bay in pure style for an hour and a half taking in surreal views of Alcatraz Island, Golden Gate Bridge and the magnificent city skyline. 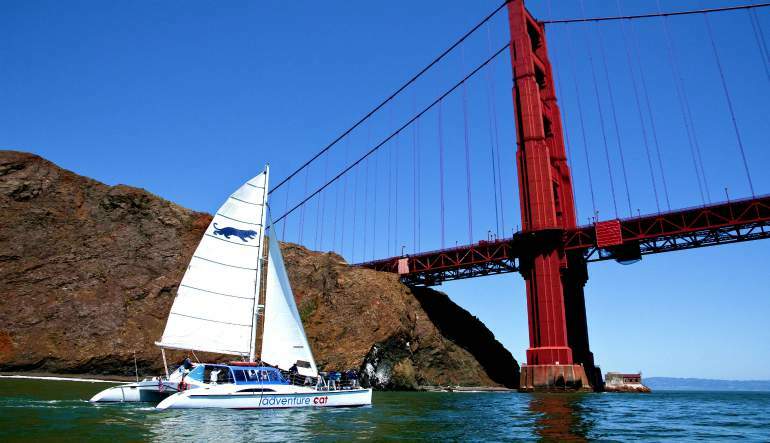 Sail the San Francisco Bay in pure style for an hour and a half taking in surreal views of Alcatraz Island, Golden Gate Bridge and the magnificent city skyline. This trip is fun for the whole family and great for all ages. This tour even offers a bit of an adventurous ride for those who would like to step on to the trampoline deck and get a little wet and wild. This netting is also a nice place to lay back, relax and catch some rays when the catamaran is cruising at a leisurely pace. The Catamaran also has a cabin with 360 degree views where you can take a seat and purchase snacks, soda, beer and wine. In full sail the catamaran can reach 8-12 knots or 9-13 miles per hour as it skims the surface of the bay area waters. If you or the kids are up for a quick lesson on how to navigate this catamaran, head on up to the captain and take the helm and experience steering first hand. The crew is more than happy to take photos of you and your family during the tour using San Francisco's historic landmarks as a back drop, creating photos you will look back on years from now and think of what an amazing time you all shared. I had an awesome time, the staff were awesome & id recommend them to anyone at this point ! Thank you so much! Many thanks to the crew. We had a ball and they were a big part of the reason (the SF Bay can take some credit too). Great tour of SF Bay, woykd definitely recommend! There is a clean bathroom on both boats. The boats are accessible to those with walkers and canes. Though we are often able to accommodate people in wheelchairs as well, the boats are not wheelchair accessible by average standards. If you are in a wheelchair, please keep in mind that steps leading to the boat prevent you from wheeling directly on board. As a result, our crew will have to physically carry you from the dock and on to the boat while you are seated in your chair. For this reason we cannot safely accommodate guests who require this service if they weigh more than 150 pounds. We cannot accommodate electric wheelchairs. Bathrooms are not wheelchair accessible.